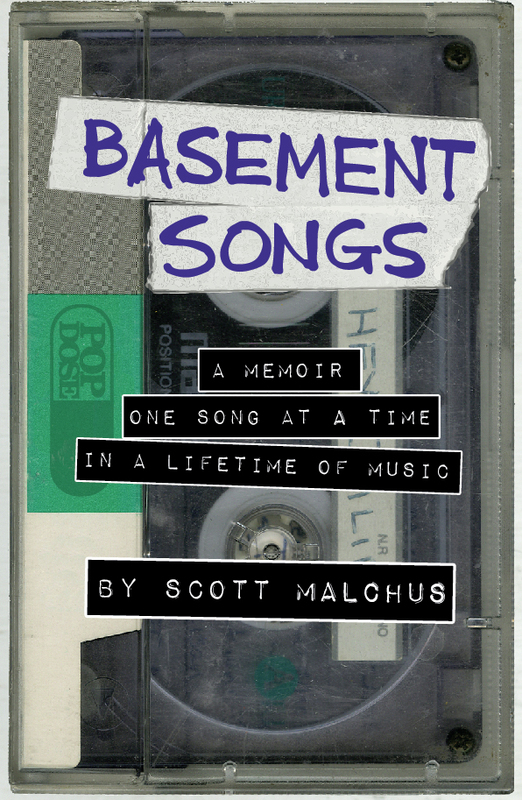 Scott Malchus has released a book called BASEMENT SONGS. You may know what it’s about. In January of 2007, I began writing a column called Basement Songs for my blog Thunderbolt. The original inspiration behind these posts was to write about the songs that had meaning to me, creating a sense of place and time to put my few readers into the moment that that particular song connected with me. Basement Songs quickly evolved into something else entirely, a sort-of memoir that was more about what happened than the song itself. In some cases the song was mentioned in passing, or in the last sentence of the column. I wasn’t writing for anyone in particular- I believe I had about 10 readers – so if I changed the rules from week to week, I didn’t anticipate anyone would mind. One of those readers was a writer named Jeff Giles, whose Jefitoblog was a source of inspiration. Jeff was kind enough to include links to the early Basement Songs entries on his blog, helping the series reach a wider audience. When Jeff asked me to join a new website he was spearheading and to bring Basement Songs with me, I jumped at the chance. That’s how Basement Songs became a part of Popdose in 2008. From that point I continued writing until I had written over 100 columns. During the summer of 2010, while dining with my Popdose cohorts, Jon Cummings and Will Harris, the idea of a Basement Songs book entered our conversation. Will had recently self-published a collection of his excellent column, All You Need is a Hook, and in promoting the book on the site, he mentioned that he’d love to someday own a Basement Songs book (he really did, you can see it here). The idea intrigued me and Will made the process sound so easy. He’d used something called Lulu and this website made the book on demand for anyone who wanted to buy it. Sounded like a no-brainer. But would anyone actually purchase a book of my writing? Jon and Will, two of my biggest supporters, implored me to publish a book. Later, Ted Asregadoo and Dw. Dunphy joined the chorus. Last December, my brother-in-law, Seann, was killed in a motorcycle accident. A young guy a month shy of 30, he was a talented drummer and wrote a variety of music. He didn’t wait for some record company to discover his work, he recorded it and released it on the Internet, taking his music directly to anyone who was willing to give it a chance. With Seann’s death I began reevaluating everything I did. Why did I write for Popdose anyway? Was it not in the same spirit that Seann was recording and putting his music out there? Was it not for the love of the craft? I don’t get paid working for Popdose, and Basement Songs has never been the most popular feature on the site. However, I know I have a group of loyal readers and with that in mind, I began compiling some of my favorite Basement Songs. I began work at the end of January this year, 5 years after the first Basement Songs was ever published. After 11 months of editing, rewriting, proofreading (thanks again, Jason) and painstakingly working with artist Joe Game to come up with a design that would grab your eyes, I am proud to announce that BASEMENT SONGS, a 200 page book featuring a Foreword by Jeff Giles, is now available for purchase. It’s available is two formats. The paperback edition is being sold through Lulu.com for $14.99. A link to the book’s Lulu page is here. A Kindle edition is also available for those of you who prefer you books digitally. It costs $5.99 and can be purchased here. Some of you may be wondering, “Gee, why buy the book when I can just go back and reread the originals?” That’s a question I asked myself before I began this endeavor. With this book, I made a concerted effort to create a narrative that begins with my discovery of pop music (thanks to Kermit the Frog) and extends all the way to a summer night I spent with my family, listening to a Journey cover band. I edited out pages of text from the original posts that I felt were superfluous, I combined some posts, and as an extra incentive, I wrote a new essay exclusive to the book (in the grand tradition of artists putting new songs on their greatest hits albums). More importantly, I have decided that 100% of the profits from the sale of BASEMENT SONGS will be donated to the Cystic Fibrosis Foundation. For those of you who have read my work over the years, you know that finding a cure for cystic fibrosis is a cause important to my family and friends, as my 11-year-old son has the disease. Alright, enough of my yappin’ (to quote the great Marty DiBergi), I hope you’ll consider buying BASEMENT SONGS, as well as checking out the book’s official website or Facebook page. If you do buy and read it, please send me your feedback and I’ll be sure to post it. I also ask that you spread the word. I don’t have a PR firm working for me, the marketing and publicity is up to me. But if you love the book, tell a friend and maybe they’ll give it a read, too. Also, you can “like” the book on the Basement Songs Facebook page. I’ll wrap this up by thanking all the readers of Basement Songs these past five years. Because of you I kept writing week after week. Link to BASEMENT SONGS paperback. Link to BASEMENT SONGS Kindle edition.